"The Night of Long Knives"
In 1976, René Lévesque and his Parti Québécois won the provincial election. And a new era of political uncertainty began in Canada. One of the Lévesque governmentï¿½s first actions was to introduce a language law, Bill 101, which declared French to be the only official language of Quebec, entrenching the right of workers to work in French and the rights of consumers to be served in French. By the end of the decade, the Parti Québécois had geared up for its main political goal. It launched a referendum asking voters if they wanted to negotiate sovereignty-association from the rest of Canada. Around the country, Canadians were captivated by the referendum campaign. Within Quebec tensions and emotions ran high as families, friends and neighbours passionately debated "Oui" (supporting separation) or "Non" (opposing separation). On May 20th 1980, Quebecers voted 60 per cent against sovereignty-association, and 40 per cent in favour of it. Addressing the emotional crowd at Paul Sauvé Arena, Lévesque promised another attempt at independence. A year later, Lévesqueï¿½s Parti Québécois was re-elected, winning a comfortable majority with eighty seats, nine more than in 1976. 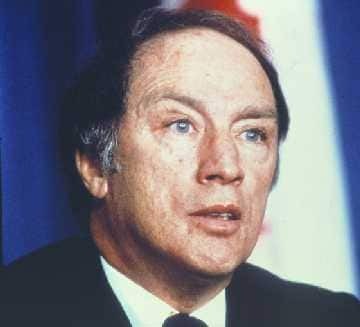 Shortly after the referendum vote, Prime Minister Pierre Trudeau turned his attention toward a lifelong goal, to bring home the Canadian constitution. The British North America Act, which had brought Canada into being in 1867, was a statute of the British Parliament. Trudeau was determined to bring home a revised constitution so Canadians no longer needed Great Britainï¿½s approval in order to change it. After much political bickering, nine of the ten provinces reached an agreement with Ottawa for a new constitution. Quebec refused to sign the agreement, accusing Ottawa of undermining Quebec power within Confederation. 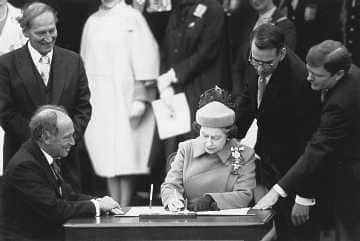 On April 17, 1982, Queen Elizabeth II came to Canada to proclaim the new Constitution Act on Parliament Hill. On that day, René Lévesque ordered the Quebec flag to be flown at half-mast. In the years to come, there would be further attempts to bring Quebec into the Constitution. In the late 1980s, Prime Minister Brian Mulroney called a series of meeting to discuss constitution problems. In April 1987, all ten provincial premiers and the Prime Minister agreed to constitutional changes, called the Meech Lake accord. In the end, the accord was not ratified and Canada's constitutional woes and Quebec's disenchantment with Confederation continued.